All web browsers remember a list of the web pages you’ve visited. You can delete this list at any time, clearing your browsing history and erasing the tracks stored on your computer, smartphone, or tablet. Each browser has its own separate history, so you’ll need to clear the history in multiple places if you’ve used more than one browser. In the future, you can use private browsing mode to browse sensitive websites without your browser saving any history. You won’t have to clear your history afterwards. To clear your browsing history in Chrome, on Windows, macOS, or Linux, click the three dots menu > More Tools > Clear Browsing Data. You can also press Ctrl+Shift+Delete to open this screen on Windows, or press Command+Shift+Delete on a Mac. To delete your entire browsing history, select from “the beginning of time” in the box at the top of the screen and check the “Browsing history” option. You can also choose to clear other private data from here, including your download history, cookies, and browser cache. To clear your browsing history in Google Chrome on Android or iOS, tap menu > Settings > Privacy > Clear Browsing Data. On an Android device, you’ll need to choose how much data you want to delete at the top of the screen. Select from the “beginning of time” to clear everything. On an iPhone or iPad, Chrome will clear all your browsing data by default and won’t allow you to choose other time periods here. Ensure the “Browsing history” option is checked here and tap the “Clear Data” or “Clear Browsing Data” button. You can also choose to clear other types of personal data from here, including cookies and cached files. 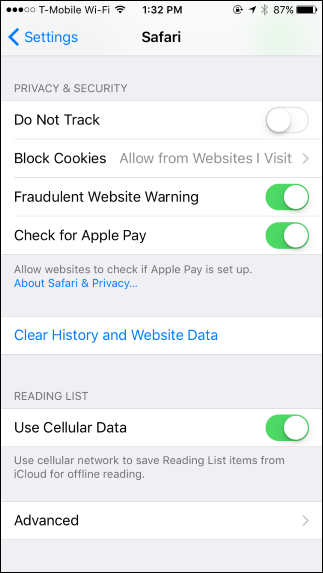 To clear your browsing history on Safari on an iPhone or iPad, you’ll need to visit the Settings app. Navigate to Settings > Safari > Clear History and Website Data. Tap the “Clear History and Data” option to confirm your choice. This button will clear all sensitive browsing data, including your cookies and cache. 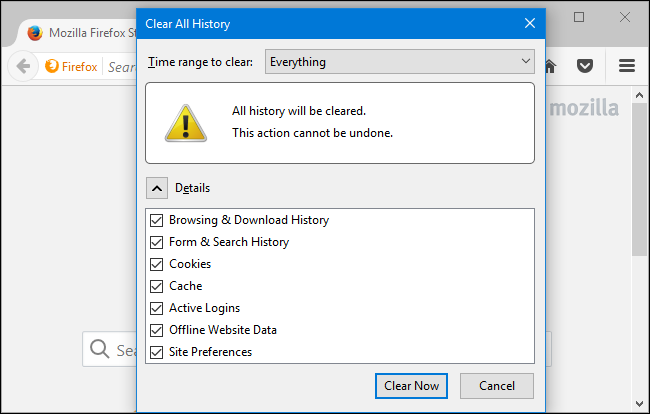 To clear your browsing history in Firefox on the desktop, click menu > History > Clear. You can also press Ctrl+Shift+Delete to open this tool on Windows, or press Command+Shift+Delete on a Mac. 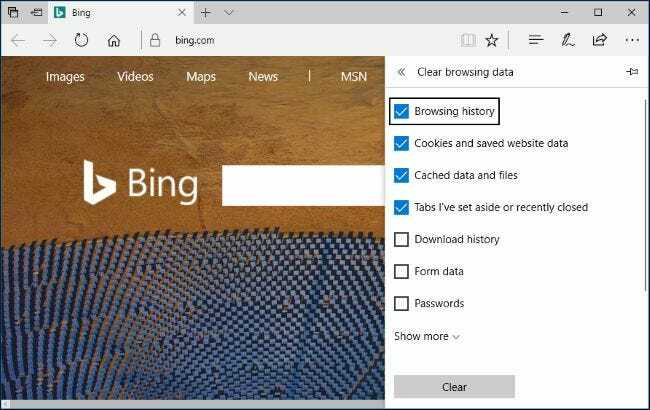 To delete your entire browsing history, select “Everything” at the top of the window and check “Browsing & Download History” in the detailed list of items to clear. You can also choose to clear other types of private data from here, including your cookies, browser cache, offline website data, and website-specific preferences. To clear your browsing history in Microsoft Edge, click menu > Settings > Choose what to clear. You can also press Ctrl+Shift+Delete to open these options. Ensure the “Browsing history” box is checked and click “Clear”. You can also choose to clear other types of private data from here, including your download history, cached data, cookies, and tabs you’ve set aside. Just check the type of data you want to delete and click the “Clear” button. 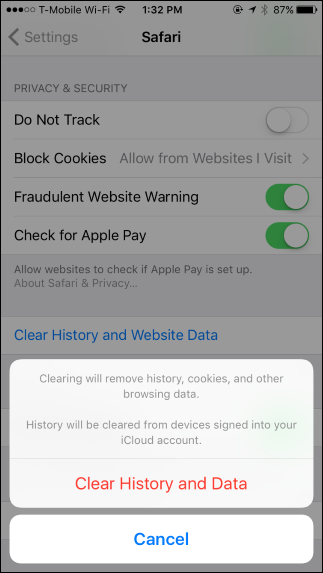 To clear your browsing history in Safari on a Mac, click History > Clear History in Safari. Select the time period you want to clear history from and click “Clear History. To clear everything, select “all history”. Safari will delete your browsing history as well as your cookies, cached files, and other browsing-related data. To clear your browsing history in Internet Explorer, click menu > Safety > Delete Browsing History or press Ctrl+Shift+Delete. Ensure the “History” option is checked here and click “Delete”. You can also choose to delete other types of private data from here, including your temporary Internet files, download history, and cookies. By default, Internet Explorer will keep cookies and temporary Internet files for websites you’ve saved as favorites. 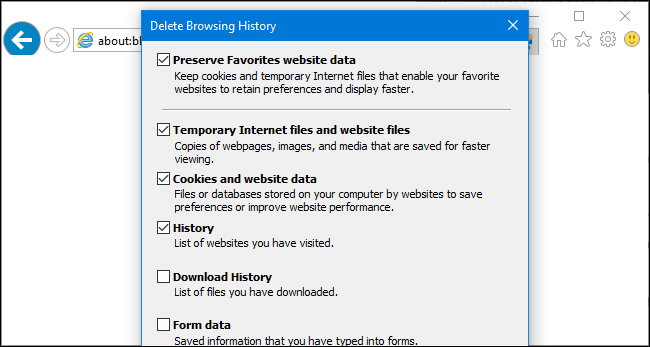 Uncheck “Preserve Favorites website data” here to ensure Internet Explorer deletes everything. 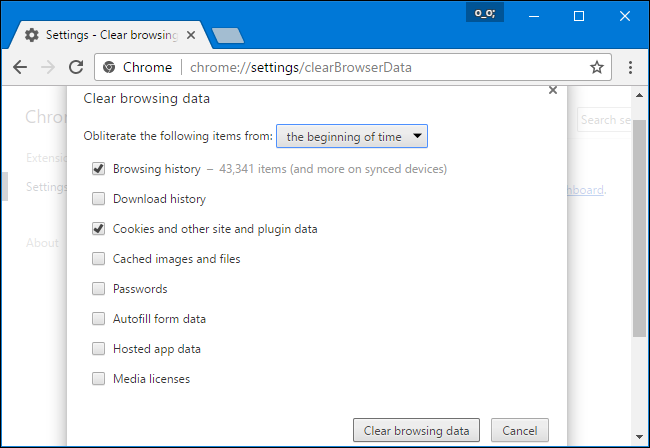 If you’re using another browser, you should be able to easily find a “clear browsing history” option somewhere in its menus or on its settings screen. 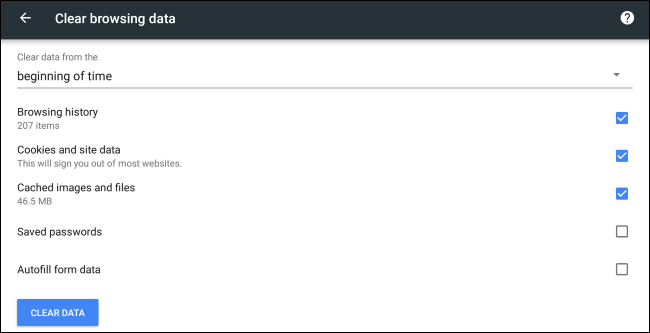 For example, in Opera, this option is at menu > More tools > Clear browsing data.